Garth Ennis Sara, with art by Steve Epting, is available now via TKO Studios. 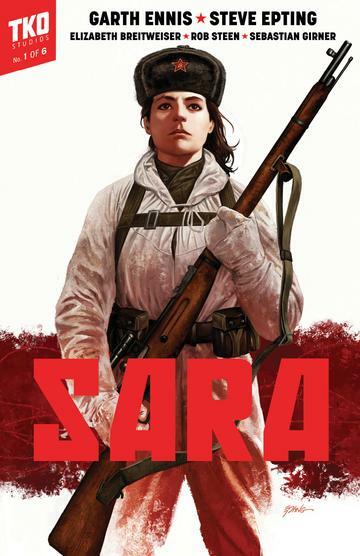 By Jarred Luján — TKO Studios recently rolled out their debut line-up, which was essentially headlined by Sara, a story about an all-female Soviet sniper unit fighting against the Nazi invasion of their country. I snatched Sara up pretty quickly because of my familiarity with both the writer and artist. Garth Ennis wrote one of my favorite books of all time, Punisher: Born, Steve Epting drew one of my favorite Captain America stories back in the day, collaborating on it with Ed Brubaker. Before I dive deeper into the story here, I want to make something clear: the art in Sara is absolutely brilliant. While this book, of course, has its fair share of shootouts and battles and explosions, some of my favorite moments involve Epting’s artwork showing the small expression changes on characters’ faces. Ennis’ script did a fantastic job building up these characters, but it’s Epting’s art that really emphasizes character moments in a way that creates a more engaging reading experience. For those of us who have read comic illustrated by Epting in the past, this comes as little surprise. Snowy Soviet plains probably do not sound like the best backdrop for a colorist to flex their talents, but Elizabeth Breitweiser does so here. Again, I’m talking mostly about small things, like the rosy cheeks in the midst of the brutal cold. Each moment a sniper bullet tears through a Nazi, the colors create a beautiful contrast of red mist and snow. So many of these pages are littered with black and white tones, yet they still convey much depth in various areas. So, going into the story itself, it’s probably relevant to note that I have personally lived my entire life surrounded by soldiers. On my mother’s side, I am literally the only male that didn’t enlist (I doubt I’ll ever hear the end of that one, btw.) My family being the way it is meant I grew up with a mixture of war being mythologized and lessons on the darkest aspects of armed conflict from people who had firsthand experience. Growing up, I’d often sit around and watch war movies with my grandfather, or exchange war books with my step-grandfather, who both regularly shared personal anecdote from their times in Korea or Vietnam…sometimes these were funny stories or tales of heroes, and sometimes they were downright terrifying. This is all a means of noting that war stories tend to draw me in more than they might the average person. Generally, there are two common ways that war stories are told. The first is your basic Good Versus Evil. It’ll usually feature the sacrifice of Good Heroes, who are certain their side is right and just, with a tinge of patriotism painted underneath. The second is about What War Takes Away. These stories feature good people doing evil deeds, corrupted by the nature of warfare. This often means a loss of decency, hope, morality, life, and—almost always—innocence. That first type of story is typically the most common way that we see depictions of World War II. There are few human conflicts where it’s so clear where each side stands, what each side represents. Sometimes these stories gloss over the wrongdoings of the side they represent, in an effort to represent them well. With Sara, Ennis has no interest in doing that. Sara, for whom the story is named, is an extremely conflicted character. She kills Nazis, sure, even efficiently, but Sara time and time again reflects on the cruelty of her own nation, the one she’s defending. This theme lends to some of the best character moments in the book, people clinging to the ideal outcomes of this war, and a jaded Sara trying to figure out where she stands in the first place. This second type of grey morality story is how the greatest war stories are told. Ennis, though, has a reputation for flipping war stories, for creating a third option all his own. That ability is what made his work on Punisher: Born so brilliant: Ennis concocted a story of Frank Castle seemingly losing something, but it isn’t until the final pages that readers learn he has instead brought something back with him. It isn’t loss, it’s converting. Ennis does more subversion of expectations in Sara. Sara’s comrades are the vehicle for this, rather than the dark captioning system that he used to accomplish it within the narrative of Punisher: Born. The parts of the story set in the past here also help us understand what’s happened to Sara to make her feel so ambivalent about the nation she finds herself serving. We discover that it wasn’t the loss of any one thing for Sara, but rather a gaining of truth. A truth that Sara’s devoted friends are not prepared for. Sara is a slow burn of a book. The first couple chapters really focus on building the situation around Sara and her team, but ultimately that slow burn becomes an explosive flourish. The ending of this story fires on all cylinders, with Ennis teaching a master class on pacing. 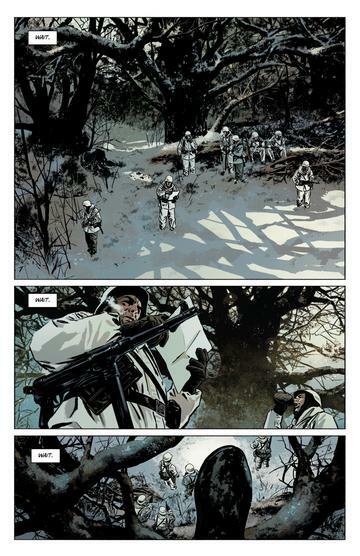 Sara, in the end, is a comic that incorporates many aspects of the real war stories my family has shared with me throughout my lifetime. Stories about that include patriotism, heroes, and glory, as well as terror, uncertainty, and doubt. Sara is a rarity in that it blends all of those things organically into a single powerful tale. Overall, TKO has picked a worthy story from a seasoned creative team to represent the publisher well at its launch. Check out more of our thoughts about trade paperback and original graphic novel on our reviews page.